Acting doesn’t get much better than the subtly brilliant display put on by Brad Pitt in “Moneyball”. On the surface, the film is a baseball story just like last year’s “The Social Network” was a film about Facebook. Meaning it’s not. I don’t usually care much about sports movies. We all know that these films usually follow a standard and predictable pattern. More the reason to embrace “Moneyball”, which is anything but a standard baseball flick. Pitt plays Billy Beane, the general manager of the Oakland A’s. He’s also a former player who never lived up to his potential. His job? to rebuild his team following a disappointing title run in 2001. Beane’s going to need help. Enter boy wonder Peter Brand (played by funny-man Jonah Hill) whose aim is to assemble a group of players that other teams would reject. Sounds like a suicide mission. And it is, at first. But is it all true? that doesn’t really matter when it plays so damn well onscreen. And that it does. Pitt, who gives one of the best performances of his career, is backed up by a terrific supporting cast, including Philip Seymour Hoffman as the Oakland A’s coach. As I said before, “Moneyball” isn’t exactly a baseball movie. It has almost nothing to do with the usual portrayal of the game we’ve seen so many times, from “The Rookie” to “For The Love of The Game”. And let me just say: that is a great relief. “Moneyball” is a clever look at what goes on behind the game, and that’s what makes it so good. The cheering moments are very few, and they mostly take place in Beane’s office and not on the field. One of the most interesting things about Beane is that he never watches his own team play or spend time with his players, which makes him a fascinating character in my opinion. “I want it to mean something … otherwise what’s the point?” agonizes Beane at the height of the A’s record-breaking winning streak. 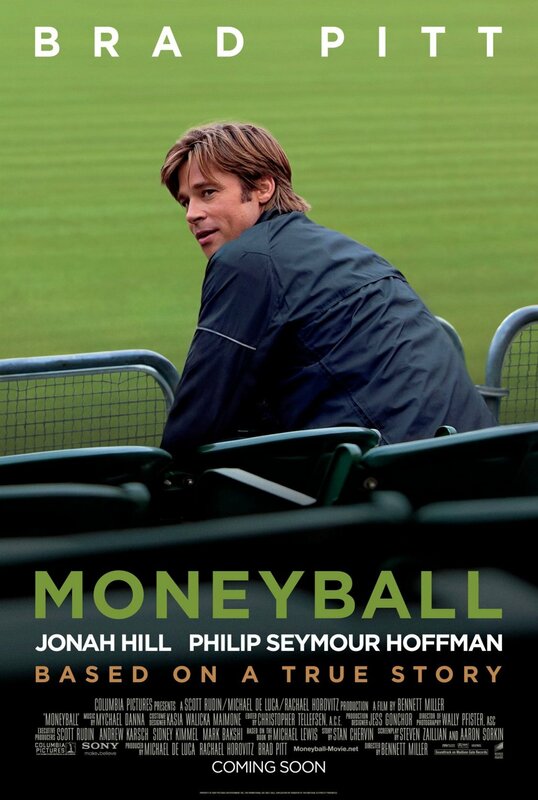 “Moneyball”, directed by Bennett Miller (“Capote”) could have been a disaster. Instead, it rises and scores a home run. It is only frustrating when it drags a little bit towards the end, but the power of the film is undeniable. I loved it.